From the Corporate Email main screen, select Settings then press OK. Select Sync Schedule then press OK. Select the desired Sync Schedule type then press the left soft key to choose Next. Select an available sync schedule or select Add Schedule to create a new sync schedule then press OK.
An available schedule must be selected or a new schedule created for Direct Push to work properly. 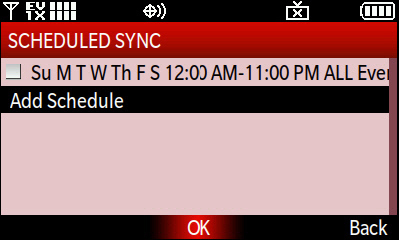 Select the desired sync days then press OK. Select the desired sync start time then press OK. 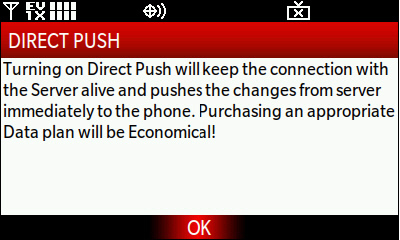 Select the desired sync end time then press OK.